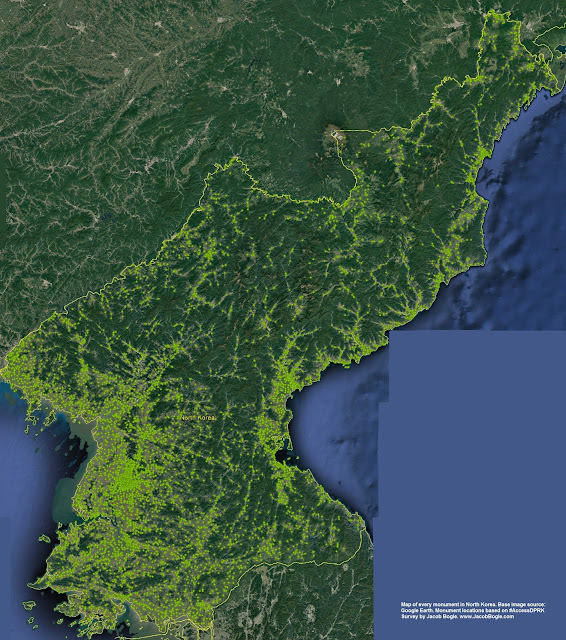 One year ago today I published Phase I of my #AccessDPRK Mapping Project. 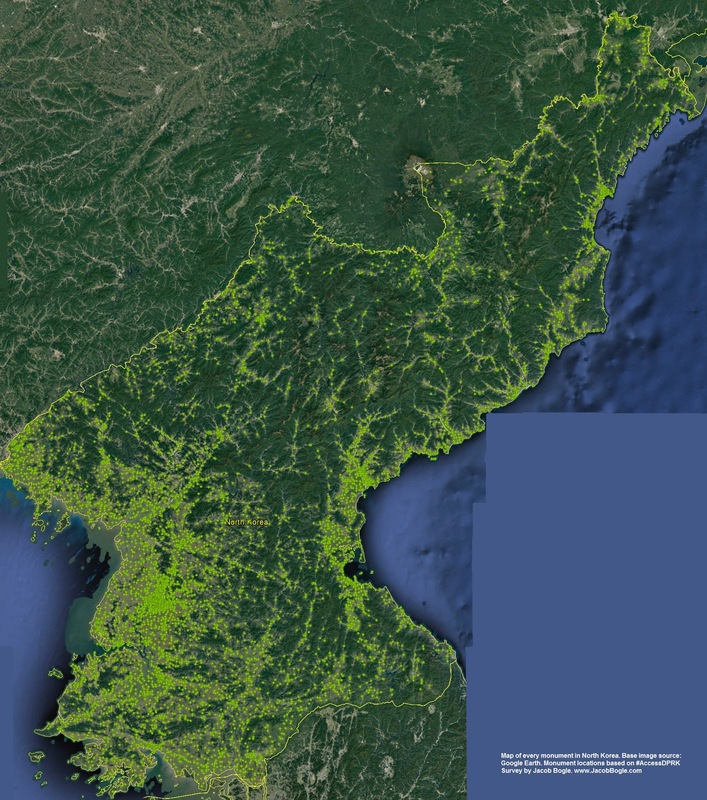 I began mapping North Korea in late 2012, little did I know how much of an effort it would take or how expansive a map would result from the over 2,500 hours of work. I won't recount why I started, you can read more about that here, but I do want to stress that this map has become the largest and most comprehensive map of North Korea publicly available, by far. The Google Earth file contains 53,722 placemarks covering three main areas of interest: the military, monuments, and domestic/economic sites. There are 9,567 military sites, 8,859 monument markers representing 9,879 individual monuments, and 35,296 domestic sites. Because I started mapping after I discovered Curtis Melvin's map and because I updated and incorporated his North Korea Uncovered into mine, I would like to say that of the 53,722 places, 8,430 of them came from North Korea Uncovered. The file is divided according to each province and each province is divided into those three main areas (some have an extra division). Those three divisions are further sub-divided into item-specific folders (anti-aircraft artillery, dams, palaces, etc.). Typically, the military division has around 20 folders and the domestic division has around 40. The monument division is just a single folder containing all of the monuments in its respective province. There is also an "Additional Items" folder that has things like all the country's airports and a list of mountains. And, there is a file dedicated to the De-Militarized Zone with 1,401 places marked. Because of the size of the KMZ file (4.76 MB - which is huge by Google Earth terms), don't try to view the whole thing at once. Expand the file and pick out which province you'd like to review and then what item folders you want. There are many ways to explore the information within, just take a little time to get used to the layout so you don't accidentally crash Google Earth (although, most modern computers can handle having the entire file open, it may be sluggish). The next part of #AccessDPRK is to create a series of topic-specific files. For example, the country's electrical grid. This will allow those with narrower interests to view the information they want without the need to dig through mountains of data. However, there is no firm time set for me to build and publish those maps. After working on this for so long, I'm in the mood to take things more slowly now. Map showing every monument in North Korea. Click for larger view (opens in new window). To download the file directly, click this link. (File is hosted on a free Google site that I use to hold various GE files). To view the host site, click here. Below is a breakdown of the number of items per province and other main folders. As soon as I can I will also add some graphics showing how many of each item there are (like the fact there's active 1,539 anti-aircraft artillery batteries). NOTE: AccessDPRK maps, articles, or other creations may not be used for commercial purposes without the express authorization of Jacob Bogle. WOW!!! Great job! I did my own NK google earth file but only Im interested in military sites, that's just incredible what you did! My question is: can you post the nomenclature you use? I use different symbols and colors than what you use and just curious what is the your legend? I divided the main file according to provinces and each province further divided into the different item categories. In doing so, I tried to be as consistent in icon/symbols use as possible and used icons (where possible) that were somewhat intuitively related to the item in question - for example, military bases are marked with "men" symbols, dams are small "wave/water" symbols etc. Since each folder has its own label (military bases, radar, monuments, factories, etc.) and the use of icons in each is the same across the whole project, I didn't see a reason to create a separate legend since it seemed redundant to me. On a side note, I'd be interested to see the file you created if you're willing to share it.